Leaves & Lawn Care - Free Food! As spring approaches you may look out your window and see the remnants of fallen leaves from last autumn. There are a few options as to what you can do with those leaves, but only one is both lawn care friendly and eco friendly. Leaf disposal can be done many ways. In the past two of the most popular ways were to either burn your leaves, or bag them and send them to the land fill. Burning leaves has been determined to be less environmentally friendly because of emissions into the air, and sending organic leaf matter to the land fill is wasting space in the fill. In the past few decades, community leaf collection has become a popular option. In the fall we often see piles of leaves along the road sides where they are collected by the township. What you might not realize is that these leaves are often taken to a composting facility, composted, and then sold back to you in the form of leaf compost in the spring. You can make the call, but to me I feel as though there is a better option. If we think back to our basic concepts of biology we realize that plants use nutrients, that they obtain from the soil, to grow and produce leaves, shoots, flowers, and fruits. The nutrients that went into creating those plant parts do not just disappear, but rather are available in the residual leaves and fruits. Leaves are composed of organic material. 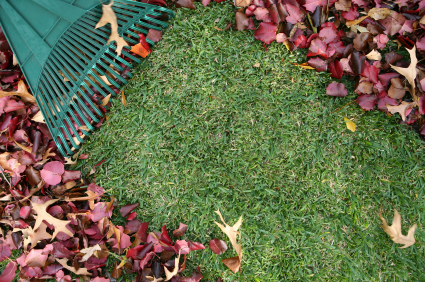 One simple step to improving the soils that your lawn is growing is by MULCHING your left over leaves as you mow. You are going to mow your lawn, just use your mower to grind those leaves up and they will work their way back into the soil ecosystem. After they are broken down by microorganisms and insects like earthworms, these nutrients become available to your lawn. Although they may be visible for the first day or two after you mow, the leaves are quickly hidden by your thriving lawn. This is a simple and cost effective way to enhance your lawn, recycle, and save you time.